The climate you create and the instructional strategies you use are one of the single biggest predictors of student success (Hattie 2002). Since we are each unique, classroom instruction must reflect our differences. Brain-based teaching says that variety and choice are one of many options to invite greater student engagement and buy-in. You may be well aware of the differentiation movement that researchers like Carol Ann Tomlinson (1999), Gayle Gregory (2001), and others have fostered. The roots of the movement go back two generations to an awakened focus on personality styles, learning styles, and, more recently, multiple intelligences and emotional intelligence. Each of these separate movements is, in fact, related. The bottom line is that we are unique, and classroom instruction must reflect that. What the instructional strategies in this chapter offer is the differentiation of conditions needed to ensure student success. While none of these are necessary conditions for mastery, for some, they may be the sufficient condition–the “difference that makes the difference” for many students. These conditions cannot be ranked because one is not better than another, and none is a “necessary” condition—that is, not necessary for all student. Instructional variety is an essential ingredient simply because students are different. Some succeed because of their peers, others because of the arts and many others succeed because of powerful role models. Every one of these key strategies forms the backbone and key structures for comprehensive and successful student learning. This chapter focuses on six strategies that are well researched as promoting mastery learning: experiential learning, integrated arts, positive role models, cooperative learning, semantic transformations, and hands-on theory testing. No one strategy will work equally well with all students. I chose these six strategies because they have high visibility, are well documentation, and are easily used by teachers. The strategies are different enough from the lecture method so that they offer the differentiation that can make a difference for many students. 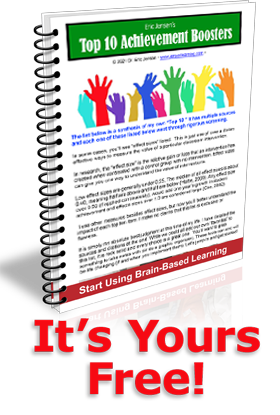 Use brain-based teaching so that variety and choice will invite greater student engagement and buy-in. There has always been a portion of students who will struggle or fail in nearly every area of school until, that is, they get to do something physical or outdoors. A portion of students practically live for these activities that may include vocational or outdoor, project-based work, field trips, apprentice learning and service learning. As a generalization, keep your younger students closer to school. Third grade students, for example, are more likely to get overwhelmed by the high novelty of outside experiences, depending on their previous, at-home experiences. They’ll remember the field trip and but will have learned less from it than if you just use, a simple outdoor science activity within the school grounds. By the fifth grade, students are more ready for the novelty of a big adventure and would be less likely to be stimulated by a near school outdoor lesson (Falk and Balling 1982). Research suggests that the best time for a field trip is early (but not the first thing) in the unit. But it should be preceded by a short preparatory time that focuses on familiarity, process and goals for the upcoming field trip (Orion and Hofstein 1994). Many educators have found that the combination of the field trip and another strategy, such as peer teaching, is enough for your students to outperform those staying in class (Santiago 1999). In addition, exposure to ethnic groups outside the traditional classroom can favorably change attitudes towards minorities (Drew et al. 2004). * Hands-on experiments for math, biology, science, physics, etc. Again, we can see how the use of brain-based teaching by using variety and choice are one of many options to invite greater student engagement and buy-in. For many students, arts are the missing ingredient that allows the connection to their culture and their favorite form of emotional expression. This is critical to engagement and motivation because for many (not all) students, an emotional connection is fundamental to a cognitive connection. This domain includes visual, graphic, musical, or dramatic arts. * Provide partnerships and learning opportunities for the adults in the lives of young people. * Offer healthy new challenges for those students already considered successful. In addition, others have argued that arts work because they develop student assets and capacities needed for life. Arts offer students more experience with diversity and other cultures outside of their own. They develop perceptual, emotional and cognitive skills that might not otherwise be engaged or developed (Jensen 2000). Studies have shown that music training is correlated with better memory (Chan et al. 1998), improved reading skills (Douglas and Willatts 1994), and spatial temporal reasoning (Rauscher et al. 1997). While integrated arts make sense, a separate course where students can explore a favorite type of art in depth ultimately provides the most value. Using arts with brain-based teaching is a sure way to give variety and choice as one of many options to invite greater student engagement and buy-in. When students can see how a task is done well, their success usually goes up (Hodges and Franks 2002). Many students, especially those from broken homes, have never seen a successful adult. This makes it tough two ways. First, they have difficulty knowing how to behave. Second, without positive role models, it’s tough to be hopeful about the future. Culturally appropriate role models are helpful, suggesting that schools ensure these are available for students (McLean 2004). The role models must have a positive attitude toward teaching and learning. Are role model teachers similar to good parents? A group of 452 sixth graders were surveyed and among the key findings were that students chose the same attributes that you or I might expect of parents. The students gave high marks to high expectations (maturity demands) combined with plenty of positive strokes (Wentzel 2002). In one study, teachers provided students with ample interaction so that students could apply their classroom knowledge. They also demonstrated how rewarding the profession could be (Althouse et al. 1999). * Create a project for students to become role models to younger students. In many classes, the way cooperative learning is used gives just a fraction of potential benefits. Used properly, it has far more capacity for change than just grouping does. Cooperative learning is inclusive, social, and active; and it can drive depth of learning while still providing greater feedback. Studies early on suggested it was highly effective (Yager et al.1986) and it has been used effectively with all types of students including at-risk students (Ginsburg-Block and Fantuzzo 1998) at the elementary level. Many side benefits of cooperative learning have surfaced in the literature. Teachers may see an increase in student’s emotional intelligence skills (Johnson, et al. 1993), status and self-esteem (Petersen et al. 1991). These skills are important because social skills may influence achievement in groups (Chiu and Khoo 2003). Even when distance learning is used, compared with either individual study or with multimedia approaches, the cooperative learning results were superior (Boling and Robinson 1999). Appreciate how this simple strategy can be a more brain-based teaching option to invite greater student engagement and buy-in. Comprehend the original content, context, and make sense of the format. Decide on the meaning, either literally or figuratively. Reshape the thought into a sentence, paragraph, or picture. One of the strongest reasons for using semantic transformations is that they can show whether a student understands the material. Every time a student learns a vocabulary word, make sure she can define it without using the original word itself. There is no one best strategy. My best advice is to try new strategies and combine them with your strengths. For example, if your strength is in varying and tweaking the process of peer teaching, your students might achieve more with that strategy simply because you have worked out the nuances to make it extra effective. Here’s a semantic transformation scenario: You introduce an idea for 5-8 minutes. Then let students write about it, summarizing what you said. Now, allow students to work cooperatively, reading their summary and getting feedback. Add peer teaching to strengthen their learning, since it is well supported by research (Fantuzzo et al. 1992) and (Utay and Utay 1997). Even learning simple vocabulary words is better with peers (Jones et al. 2000). Reciprocal teaching, where students teach to each other and can get feedback on their content, is well researched (Rosenshine and Meister 1994). When students learn new material in the sciences, emphasize vocabulary work in small groups, as students practice defining terms in their own words. Now allow students to take that information and re-group it into new categories such as: 1) alphabetical 2) by chronology 3) by relevance in today’s world 4) by physical location 5) by influence on economics, politics or money. The point is, the more different ways we think of a topic, the better we understand it. strategies work by helping students pay attention, learn through repetition, create new brain connections, and by providing motivation and emotional connections. We love how this can help you use brain-based teaching to add variety and choice as one of many options to invite greater student engagement and buy-in. There are few satisfactions in life greater than being right. Student’s experiences are no different. Allow them to make an educated guess (they should be able to explain their reasoning) about an upcoming event (real or literary). The hypotheses they generate have a strange way of improving learning. Hypothesis generation creates a “vesting” in the actual learning. Most students are interested in how they did, relative to the outcome. This instructional strategy is also a great way to develop and strengthen learning. Theory testing is especially good for science, math, outcomes in literature, and other exploratory, problem- solving disciplines. Students become interested in the nuances of the process because they will become explanatory vehicles for their eventual success or failure. Students will remember the knowledge because of the emotions vested (Cahill 2002) and (Christianson and Loftus 1990). Being right is a memorable event that will get retold (to peers or parents, no doubt), and that repetition is likely to strengthen the learning (Raney G. 2003) and being wrong generates emotions of disappointment or anger. Since our brain is more heavily weighted toward the recall of negative information, even the faulty hypothesis experience will likely get remembered since negative outcomes stimulate the brain’s memory systems (Schultz et al. 2002). Here’s another simple example. Let’s say I’m a math or physics teacher and am about to introduce a concept. I might bring in objects to show to students or to let them do the experiment. But there’s more. If the concept involves speed, gravity, numbers or weight, I’ll let students predict (or bet on) the outcome. Maybe they predict how many seconds it will take for an object to hit another object. Have them write down their answer, write out how they came up with their answer, sign their name, and put down a hypothetical “bet” in dollars. How sure are they of their answer? Later, they get to check their answers (and revise or celebrate). Another positive is the benefits to those who are much more kinesthetic learners; it gets them out of their sedentary positions so they can get going. The genius of hypothesis testing is that it almost forces us to pay attention, get vested, learn from it&madash;then the emotions help us recall it better. Make a promise to yourself that you’ll add one strategy that you don’t already use as soon as possible. Then add more as your comfort level grows. Reaching all of your students has more to do with the quality of teaching and less to do with luck, their socioeconomic status, class size, administrative leadership, age of the building, or some of the more commonly cited influences on student learning. The choices you make to either use a strategy or not use may be more important than the IQ of your students. As I’ve said, brain-based teaching gives you the variety and choice for your options to invite greater student engagement and buy-in. Gregory, G. (2001). Differentiated instructional strategies. Thousand Oaks, CA: Corwin Press. Tomlinson, C. (1999). The differentiated classroom. Alexandria, VA: Association for Supervision and Curriculum Development.